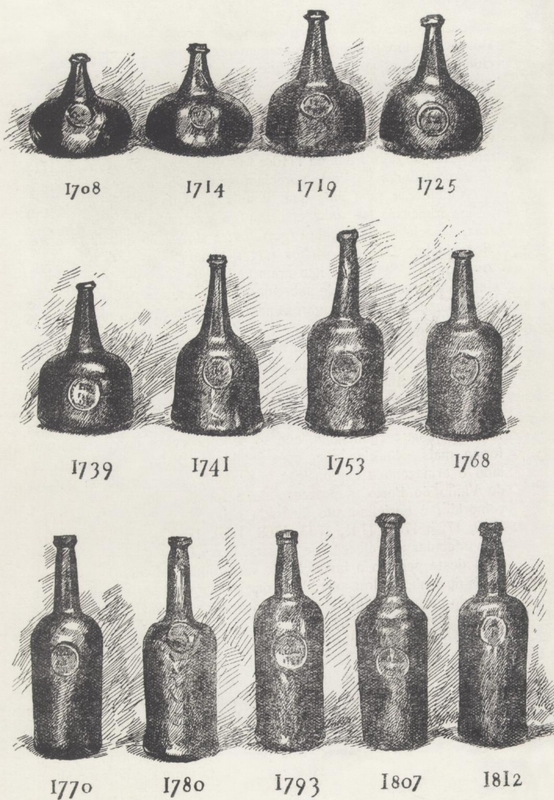 The evolution of bottle shapes during the 18th century made possible the storing and ageing of wines; or perhaps it was the realisation that some wines benefited from ageing that prompted the development of a bottle shape more suitable for “binning” – that is, storing bottles on their side to keep the cork wet, and therefore the seal intact for a longer period. In the 17th century wine bottles generally had fat, round bodies with squarish shoulders and rather long necks. The shape is well named “shaft and globe.” It was also during the 17th century that cork became more widely used, replacing glass stoppers (rather like the stoppers in modern decanters). By the end of the century the bottle-screw (now known as a cork-screw) was developed, which allowed corks to be inserted deeply and more snugly into the bottle neck. The bottle shape continued to evolve in the 18th century, first into a flatter round belly with a long neck, known as an onion shape. In rapid sequence other shapes were developed, first the bladder or balloon shape (fat and round but with slightly more vertical sides, and long sloping shoulders), then the mallet (straight sided but with the foot of the bottle rather wider than the shoulder) and finally by mid-century, the first cylindrical bottles. These still had a short fat shape albeit with vertical sides, and a long neck, but evolved by the early 19th century into a taller narrower body with a shorter neck, not too far away from modern shapes, only a bit more square-shouldered. In 1821 Ricketts & Co Glassworks of Bristol (England) patented a machine which could mould bottles of uniform size and shape. Throughout this period, and well into the 19th century, wine was sold by measure, e.g. a cask or pipe. The buyer would either keep the wine in cask at home, and only use a bottle to carry the wine from cask to table, or the wealthy buyer might have their own bottles which a merchant would fill for him. Private bottles had some kind of boss impressed with a seal to identify the owner (not the wine), and are prized collector’s items now. Even the moulded bottles of the 19th and early 20th centuries were finished by hand and are worth keeping if you have the good fortune to find one (and hopefully enjoy its contents!). Since the early 19th century, the basic shape of the Port bottle has changed hardly at all, but details make all the difference. Darker glass is used now to better protect the wine from light. The shape of the neck has evolved to include a slight bulge to allow the passage of air over the wine as it is poured out, which assists the “opening up” of the wine during the decanting process. But the position of this bulge versus the length of the cork is critical – if too much of the cork is in that bulge space, then extracting the cork, which must first compress to be drawn out through the narrower upper end of the neck, can be a real challenge, if not a downright frustration with very old bottles and fragile old corks. Even now, after more than 200 years of cylindrical bottles, we are conducting research and continue to fine tune the bottles used for our Vintage Ports.